On March 15, 1985 the first domain name was created: Symbolics.com. By 1992, a modest 15,000 existed. 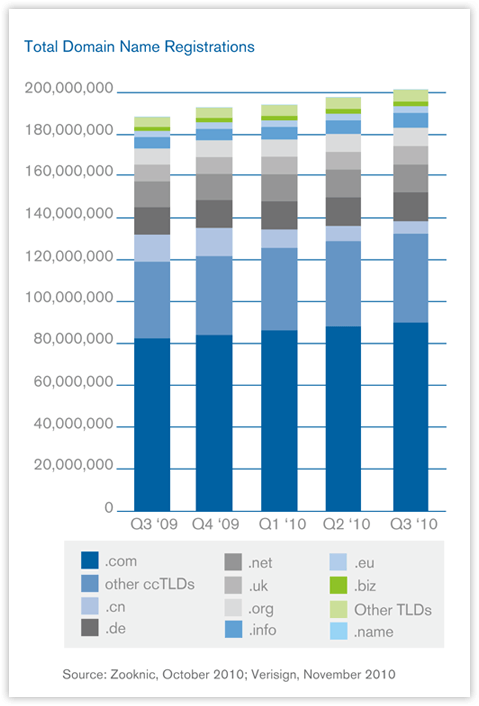 Can anyone guess how many domains are registered now, in 2010? I will give you a hint: The number contains more zeroes than my paycheck. To be a little bit more precise, the actual number of domain registrations is 201,800,000 plus or minus, oh I don’t know, a few million. It must be noted, however, that there are not necessarily 201,800,000 websites in existence. The 201.8 million number represents the amount of domains that have been registered. There are many domains that have been registered but are simply parked waiting to be sold at a premium (i.e. no website – 12% of all .COM/.NET domains have no website); then there are millions of blogs/websites that operate as sub-domains (i.e. websites that are not counted in the domains registered number) on services such as Blogspot, WordPress, Posterous, Tumblr, Blog.com, etc. Regardless of the exact breakdown on the types of domains and how many actual websites exist, I don’t know about you but I don’t know of any other species that can register over 200,000,000 domains in 25 years. Three cheers for us: Hip-hip-hurray!